Want to use the Internet to get more customers but don’t know how? Feeling overwhelmed by all the online marketing options & not sure which ones are right for your business & budget? 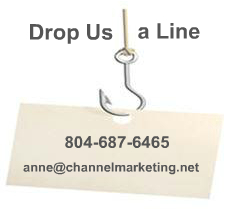 Did you know that Internet Marketing is a lot like fishing? To catch the most fish, you need to go where the fish are & use the right bait. The same approach goes for attracting customers online; go where they are & give them what they want. Here's the catch (pardon the pun): Deciding the best places to cast your lines & knowing what bait to use to attract the right kinds of customers does require some specialized knowledge and the right tools. Sometimes it's beneficial to have a guide when you're venturing into unfamiliar waters, like the Internet. That's where we come in - we've been fishing the online waters for over 16 years. And you can put our 30,000 hours of experience to work for your business! We'll make it easier for you to grow your business using digital marketing. We can be your outsourced Internet Department, a trusted consultant who advises you, or we can train you how to do it yourself. Do you need help with some or all of your online marketing programs? Would you like to find a business that can be your outsourced Internet Department? We can help. As a full service digital marketing firm, we can help increase your effectiveness online, while reducing the strain on your resources, in terms of time, money and stress. Are you ready to take control of your online marketing? Are you tired of hiring outside firms? Do you want to learn how to do it yourself – but would like an experienced guide to teach you how? Whether you’re looking for hands-on training, strategic guidance or quick answers to your online marketing questions – we’re here to help you.